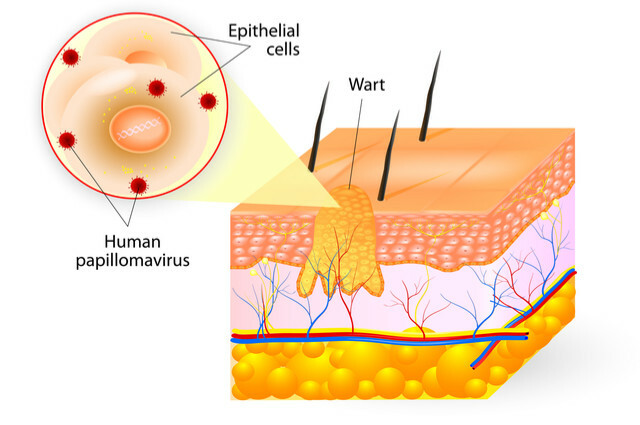 Cross section of a wart. Image by Designua (via Shutterstock). If you read the back pages of your newspaper often (and this blog of course), you will be aware of how cryotherapy benefits sports stars. We have also looked at how dogs can benefit from cryotherapy treatments. Plus, how it is possible to cover certain parts of your body as well as the whole of your body. Besides helping the likes of Leicester City and Saracens, cryotherapy can be to treat warts. Warts are a skin growth. They can range from being discrete and a slight nuisance, to standing out like a sore thumb. There are three types of warts: plantar, genital, and flat warts. Apart from those of the genital variety, they are harmless. Verrucas are the most common variety, which occur on the foot. Treatment of verrucas are possible through proprietary solutions like Bazuka and a pumice stone. On the foot, they can be painful. With a single wart, full body cryotherapy would be overkill. Using a liquid nitrogen canister, your doctor can freeze the warts. Cryotherapy kills off the cells and within weeks, the dead tissue of your warts fall off. Cryotherapy is used as a last resort compared with other methods. These include salicylic acid, where the acid burns off the top layer of your wart. Laser treatment is another popular option, even with those which are hard to treat. Minor surgery may entail the use of an electric needle as well as cryotherapy. What about verrucas and cryotherapy? A blast of the liquid nitrogen can be used for curing verrucas. If you’re an avid swimmer, cryotherapy can be useful before a swimming gala to keep your arms and legs in good working order. As well as wearing a verruca sock for fewer days than you may have expected.